The first volume of Grant Morrison's Batman, Incorporated demonstrates just how versatile a writer Morrison is. The stories run from entertaining if mundane team-ups between Batman and regular members of his Bat-family, to location pieces profiling individual members of the Batman, Inc. network, to the kind of time-shifting, multi-perspective work Morrison is known (and often praised or cursed) for. This is ambitious, adventurous work, though the end is just the beginning (a theme of the book itself). This may disappoint some readers hoping for more than just a prologue in Batman, Inc.; there is a second story here just below the surface -- as there often is in Morrison's works -- that I found interesting enough, but ultimately my expectations for this one might just have been too high. It's hard to know what you're going to get, chapter after chapter, in the first volume of Batman, Inc.. The first two issues are a Batman/Catwoman team-up in Tokyo; well-written, but nothing to truly raise Batman, Inc. to the level of Morrison's earlier works (the first two issues of Batman, Inc. do not compare, for instance, to the first two issues of Batman and Robin). With issue three, however, Inc. becomes a trippy time-traveling tale full of false identities and double-crosses; this extends as something of a trilogy through issue five. Issue six is a bit of scene-setting for the Batman, Inc. network overall; issue seven profiles the Native American Man-of-Bats and Raven in a story where Batman hardly appears. Issue eight is a "regular" Batman/Oracle team-up, differentiated only by computer-generated art. "Issue nine," which with the DC New 52 became the first part of the Leviathan Strikes special, is mostly a Batgirl Stephanie Brown story with a little Batman thrown in; the second half of that special returns to the book's earlier trippiness for a altered tale that rivals the end of Final Crisis in its complexity. I emphasize this to underline the range of stories found in Batman, Inc.. It may not seem so impressive for Morrison to write a "regular" Batgirl story, but it is impressive that Morrison can write the "out there" Doctor Dedalus issues and then also do a (close, but not quite) Bryan Q. Miller impression for an issue dedicated to Batgirl Stephanie Brown. Given how bizarre Morrison's work can sometimes be, I'm often surprised when I'm reminded of this important fact: Morrison is also a fan and he also loves these characters even more perhaps than some other creators do, and it shows through in the range of his work. The Dedalus conflict is what will define what Morrison calls the first "season" of Batman, Inc.; it's complicated, but not as hard to surmount in my opinion as Final Crisis. We encounter Dedalus first when he's imprisoned by British super-team the Victory Vs; the Knight seems to time-travel here, but I think it's more just an artful flashback from the end of their attack to the beginning. The scenes of Dedalus's own perspective are equally unclear, but explained away at least in part by Dedalus's dementia -- when he seems to have killed his aide, for instance, this is a trick of Dedalus's own mind played on the reader, too. "Leviathan Strikes"'s final chapter is the most similar to the end of Final Crisis, employing numerous shifts in time even as the forward action continues. Batman Bruce Wayne seems to attack Dedalus in his psychedelic headquarters, but later perspectives show the room in ruins, with Dedalus behind instead of in front of Batman. The finale takes place on the ship Leviathan, sinking fast; however, Dedalus only causes the ship to sink some pages later, and when Oracle sends reinforcements to the ship, it is whole and sailing. The ship is rising, figuratively, even as Batman's fortunes are sinking; in keeping with the story's theme of "oroboro," the end of the story is equally an aspect of its beginning. Like the word "Leviathan," this is another of Morrison's clues as to the villain Leviathan's identity -- Morrison's Batman saga is returning to where it began, as well. I have faith in Morrison, but I actually found Batman, Inc.'s conclusion a let down. We've seen Talia al Ghul give over her son to Bruce Wayne, and then fight and fail to get him back. Damian remains a point of contention between the two, but when the newly resurrected Bruce Wayne talks about having seen an apocalyptic future, and Dedalus is working for the skull-headed Leviathan who promises a world-wide reign of terror, it seems far too simplistic that this boils down to Talia trying to get Damian back from Batman. The sole saving grace is the weird bat-figure at Talia's side, one who (as of Batman: The Return) himself seems to be a time-traveler and suggests an extra level to what's to come. Under the surface of Batman's Leviathan problems, however, Morrison is also integrating with modern continuity Batman's Silver Age relationship with Batwoman Kathy Kane. Morrison touched on this way back in Batman RIP, and it's a treat for fans who've stuck with Morrison this whole time (and really, who hasn't?) that he's delving into more detail now. I had understood that Batman, Inc. was not always the intended direction of Morrison's Bat-saga, but the Kathy Kane tie throughout the books makes it seem that way, and adds to the scope of this story. Batman's relationship with Kane has long been a sore spot in continuity -- Bronze Tiger remembers his hand in Kane's death (or did, pre-New 52), but Batman never mentions her -- so it's great to see Morrison make it all make sense. That Morrison suggests Kane is still alive and returning for Batman, Inc.'s next season was the best part of the conclusion. 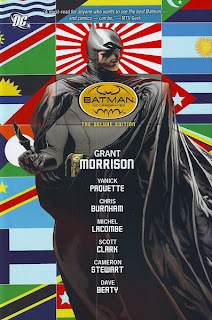 The first volume of Batman, Incorporated was not as dynamic as I expected; despite that I praised Morrison's "regular" issues, I'm surprised to see so many of them in this book, with less space given to the really wild international concepts the title promises. Batman, Inc. is well-illustrated throughout and offers a more detailed reading experience than most Batman comics you'd pick up, but it left me wishing this book's real story would get here already. Next week we're back in the DC New 52 -- times two! -- with the Collected Editions reviews of Batman: Court of Owls and Green Lantern: Sinestro. See you then! @CE I 100 percent agree with your review. I heard soo many good things about this series from many different reviews. Of the entire collection, it was mostly hit or miss with me. The first two issue with Batman/Catwoman was solid. There were some story problems with Yanick Pacquette artwork, but overall I enjoyed his DKR style Batman. The larger overarching storyline with Dedalus completely lost me. I had no clue what was going. Just like with many of Morrision's writing, he gives the reader very little in order to hold on to in understanding the story. Sometimes I think he has a good idea of what the story should be in his head but on paper, doesn't exactly conveys very well on a issue by issue basis. I felt Issue 6 should be have been the first issue of the series. It gave the reader the basic idea of Batman Inc and looming threat of Leviathan. Issue 7-8 and the Cameron Stewart-drawn Batgirl part of Leviathan Strikes were many favorite of the series. It was surprising straight forward and grounded for a lot of Grant Morrison writing. Maybe it was because I read a lot Jason Aaron's Scalped series to appreciate the Native American setting. Grant Morrison did a good solid take on Stephanie Brown, but Bryan Q Miller's spunky version is still the definitive depiction for me. The Tron-Internet Batman lost me. Overall, I think I *liked* it but I can't say I enjoyed it. I'll give Morrison one thing: unlike other collection which I can finish in less than 20 minutes, I definitely got the biggest bang for my buck with this one. Thanks CE. Great Job as always. I look forward to reading your review of Scott Snyder's Batman. Keep up the great work as always. Any time I read a Grant Morrison issue, I immediately follow it up by reading one of the many annotations sites out there so I can understand what's going on! I found most of Batman Inc. to be straight-forward, but that last part was very confusing, in the same way, as you said, that the final issue of Final Crisis is confusing. My take on the ship and the room with Dedalus was that it was more than one room; a labyrinth within the ship to confuse the person "trapped" there (Dedalus mentions about mentally breaking other people there). I also agree that Grant Morrison is possibly the most "bang-for-your-buck" (mainstream) writer out there, as you often feel compelled to re-read the story a few times to get the full understanding of it. This can be frustrating at times, but I've found I've been helped out by those annotation sites. Then when you go back and read it again, with a better understanding of what's going on, you can appreciate more how deep the story is that Grant is telling. Not for everyone (certainly not typical for mainstream superhero comics), but part of the enjoyment can be in that interpretive challenge. Unlike most people, I was underwhelmed by the first two issues of the book, and it only started to click for me once Morrison introduced Dr. Dedalus and his labyrinthine plots. By the way, I've yet to receive this HC, but I hope they corrected that coloring error in the scene where he imagines himself killing his henchman. Things got even better in the two stellar stand-alone tales with art by Burnham, but the quality took a dip with the virtual reality issue, thanks in no small part to Scott Clark's terrible CG artwork. Thankfully, the last two chapters were a terrific return to form, and I can't wait for the second "season". However, I can't help wondering what stories Morrison had to drop when the first "season" was shortened from 12 to 10 issues (if you count Leviathan Strikes as two). Maybe he just had to cut two other stand-alone issues featuring other members of Batman, Inc, or the raid on Dr. Deadalus' boat was supposed to run for more than one extra-sized issue. Batman, Inc. clicked more for me with the Dedalus plots, too. I admire Morrison's ability to write "regular" adventures, but there's so much opportunity to read that elsewhere that I've come to demand more weirdness from Morrison, right off the bat, every time, for better or worse. I daresay Morrison hits some wonderfully emotionally beats in this one too, however -- Damian's face when he saves Batman from Dedalus and Batman on the phone with Talia, to name two. And the Man-of-Bats issue was solid, as Jackie mentions. Finally! We've all waited so long for this one! I don't think Morrison is bad writer. I just wish he gave us more (on a issue to issue basis) to grasp on to. I understand he can't reveal everything on issue one, but sometimes he makes me wonder if I start reading DC Comics all the way from the beginning (ie.Action Comics 1 etc) or start smoking some weed to understand what he's trying to convey. The second part of the Leviathan Strikes, especially the scenes when Batman was confront Dedalus, I didn't have a clue on what was happening. The weird unexplained (i could be wrong, unless I miss something) shift in time or place confused me. And despite all my major criticisms of Morrison, I still again and again pick up his titles. Cause like it or not, he's writing the titles I actually want to read (ie. Batman, Superman). @CE I look forward to reading your review on his Action Comics run. Cause surprising, my criticism of the run was not the story (which was solid and straight forward) but the art. The issue 6 or 7 with the now infamous Superman's giant teeth. Looking forward to the next volume of this. With all the changes of the New 52, it's good to know this all this insanity still stands. "he makes me wonder if I start reading DC Comics all the way from the beginning (ie.Action Comics 1 etc) or start smoking some weed to understand what he's trying to convey"
YES. I also feel like this! And yet I keep reading. Morrison's books are all re-reads for me, if only because I feel like I need to rip the pages out and pin them up on a board to understand the story. Unfortunately, I'm starting to enjoy that frustrating feeling. @D. Mark Simms, what are these annotations sites you speak of? I have a feeling they would be a great help! I also feel when I'm reading Morrison that I'm missing something; either some old DC history that I'm unfamiliar with (he seems to draw upon the older and/or more obscure stuff, whereas compare to Geoff Johns tends to reference the more famous stuff that I'm familiar with). Reading the annotations I discover that sometimes Morrison is referencing Golden/Silver age stories, and sometimes he's just making it up! I remember thinking that I should have bought that "Black Casebook" TPB just because it had a bunch of stories that I think he's referenced a lot in his Batman. Anonymous, unfortunately there doesn't seem to be one single site that covers all of Grant's Batman works. Personally I enjoy the ones done by David Uzumeri, but even those are kind of spread out. CE, I hope you don't mind me providing these links. WOW. Thank you for the links! Finally I can read Final Crisis without needing a drink! No one's bashing Morrison here, but still I feel I should offer a word of defense. Morrison's books are complex, but I don't think they're too hard to understand (and despite Morrison's admitted drug use, I disfavor the trope that "complicated narration" equals "the author must be on drugs." It might just be complicated narration). I adore Seven Soldiers, for instance, because it doesn't spell everything out, but rather uses comics' words and pictures in the purest form -- there's events going on in the pictures that the words never acknowledge, rather than the words and pictures always having to reinforce the same message. And to the craziness of Dedalus in Batman, Inc., at times the fact that something doesn't make sense is what the reader's supposed to take from a scene. I think some of Morrison's more ardent critics (not here; out in the badlands) struggle because they're intent on making sense of every little instance, when at times the point is indeed obscurity and not clarity.